For me, when it comes to decorating, a room is never done…done as in I’m madly in love with every little thang and I’ve checked everything off the decorating to-do list. Often times when working on a room, I finish a DIY, bring in new accessories or rearrange some existing ones and suddenly a whole new slew of ideas flood my brain and before I know it, I’m ready to re-design the whole room all over again. That’s where I’m currently at with the master bedroom. It’s a problem, I know. I just can’t help myself! It’s a good and bad problem to have. At times it’s hard to quiet the voices in my head and ignore the urge to re-do what has already been done. Ugh! The life of an over-active creative mind. That’s why I’m here today…to explain. You see…the voices won out. Remember these? My beloved DIY curtains that I slaved over for 6 hours? Another DIY / Ikea / gros-grain ribbon collab, but I think they work much better in this space. The Greek Key curtains were a labor of love and for the money spent, were truly beautiful…but after slaving away for 6 hours to produce these bad boys and living with them for a few weeks, I had one of those it’s me, not you conversations with the curtains and ultimately took them down. The problem? Our bedroom windows are just too small to really showcase the Greek Key detailing I worked so hard to make. These curtains would’ve looked stellar on a larger window, where they wouldn’t be scrunched up in a corner or half covered up by a longer dresser thus loosing all the gorgeousness of the Greek Key detailing. As much as I loved them, they really do require a bigger window to shine and in this apartment, we just don’t have that. So for now, they’re nicely folded and tucked away and I quickly moved onto plan B. 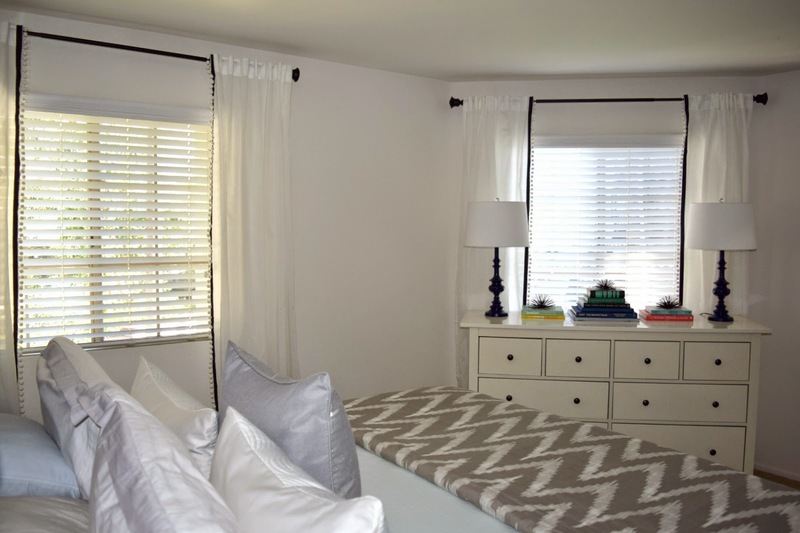 Plan B curtains follow most of the same steps as the ones I outlined in this previous post. 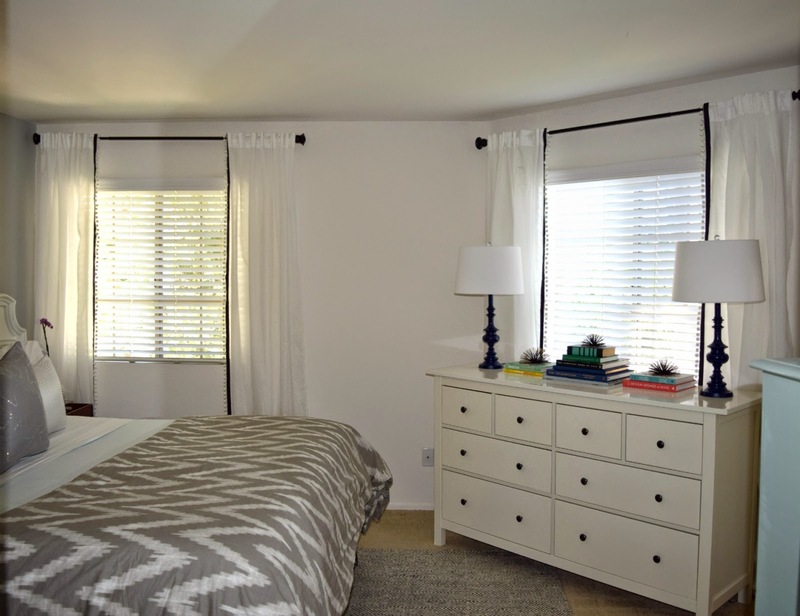 Once again, I used the Vivan curtain panels in white from Ikea and let me just say…I don’t know if Ikea is planning to discontinue these or if everyone is suddenly DIY-ing curtains using these but in the land of Ikea where all things are plentiful, these were not. Picture me…overly excited about this awesome curtain DIY that I cant wait to tackle, beelining it through Ikea towards all the flowing white drapery, only to discover that my bargain white curtains were NO. WHERE. TO. BE. FOUND! How can this be? 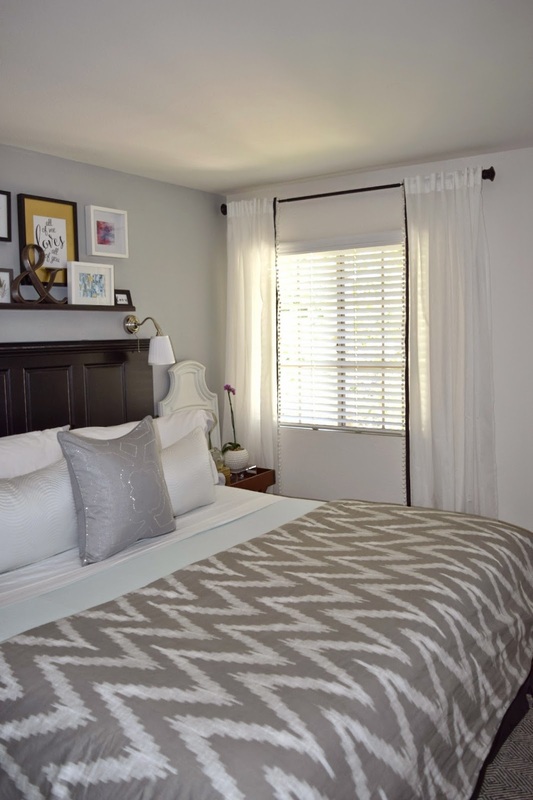 These curtains are an Ikea staple! I made several more passes through the white curtain section only to frantically realize that nope, my eyes hadn’t fooled me. The curtains were gone. I immediately tried to rethink my DIY but knew none of the other options would come close to the price point that the Vivan curtains did. Stupid me. Stupid brain for hating on the old curtains. Ugh. I had to have these curtains. I tried tracking down an Ikea employee in a desperate attempt to unearth the curtains that I just knew had to be in the store somewhere but finding an Ikea employee is like looking for water in the desert so I did the next best thing…pulled out my phone in hopes I could just order the drapes online. While I was online, I checked stock for the store I was in just out of curiosity and saw that they had 6 packs on hand. Just 6! Armed with the info that they had 6 somewhere in that colossal store, I began rifling through the displays and bins until behold…I found 3 packages. I only needed 2 but after the whole ordeal, I bought all 3 and went on my merry way. 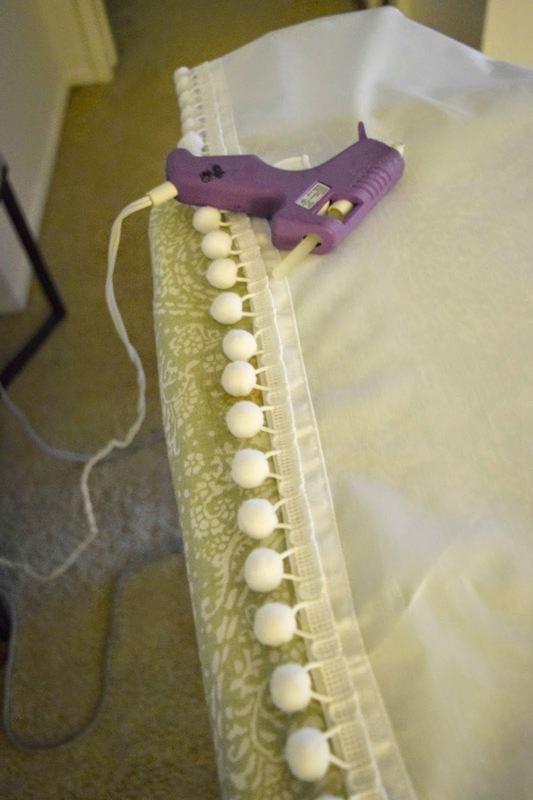 After I got home with my loot I re-measured from the top of the curtain rod all the way down to the floor (90″), added 1″ for seam allowance, added 1″ to account for the space at the very top of my curtain to where the rod rest in the rod pocket, and cut my curtains to length (92″) for an overall finished length of 91″. Using my very best friend, Heat N Bond Hem Tape, I cut a piece of hem tape the width of my raw edge, laid the hem tape paper side up along the raw edge and ran the iron over the entire length of the tape along the raw edge. Once the tape has cooled down, remove the paper backing and discard. 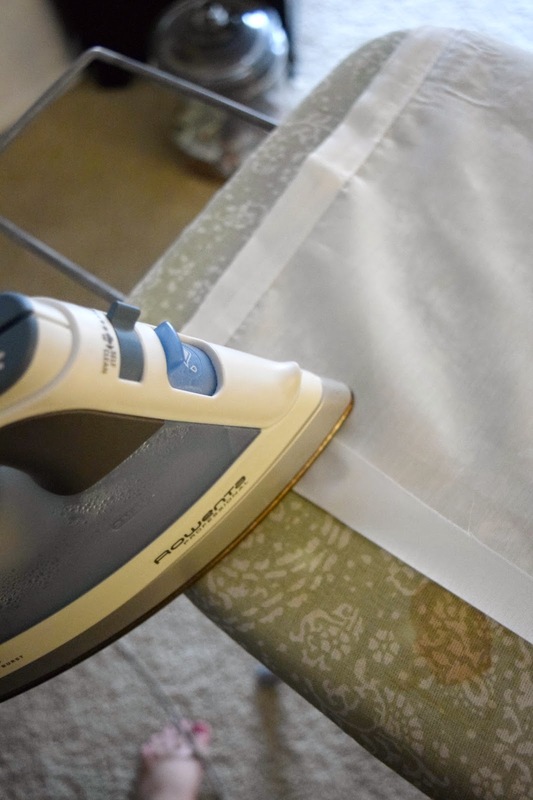 Fold the raw edge upwards and once again using the iron, pass over the entire length of the fold. 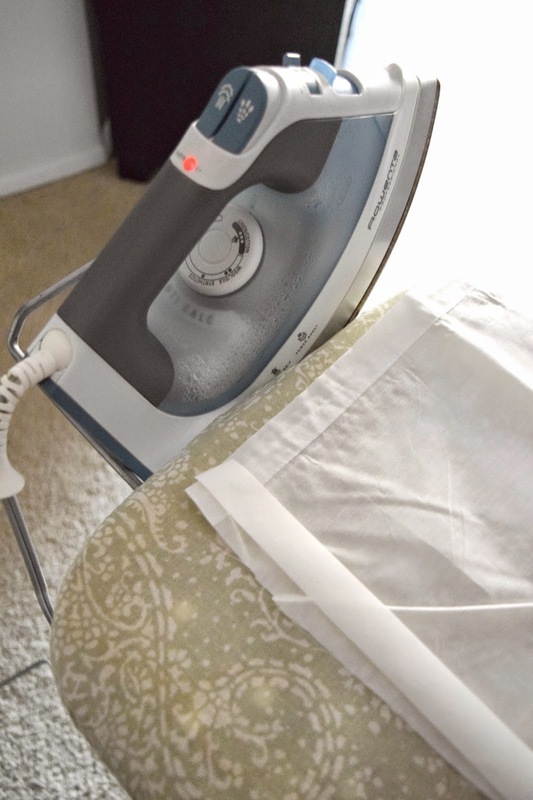 Allow the ironed fold to cool and the glue to take hold. With the curtains now hemmed, it’s time to add the embellishments! 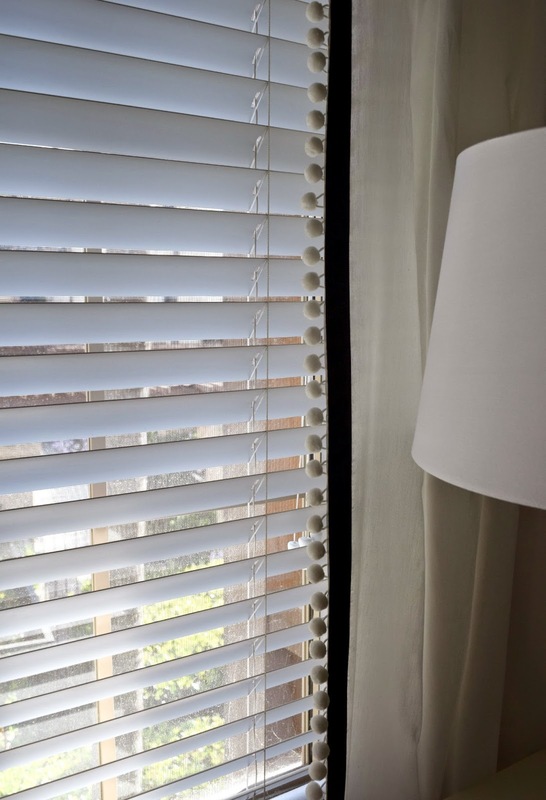 When deciding what embellishments to add to the curtains, I knew from the last go around that anything horizontal wouldn’t read well and we’d be right back to square one. After tossing a few ideas around, I finally decided on pom pom and gros-grain ribbon trim on the inner vertical edge for 2 reasons. Reason 1 – vertical embellishments would read well on our small windows and also help elongate the room by drawing the eye upwards (similar to this trick I mentioned here) and Reason 2 – I already had everything on hand minus the curtains…no extra money spent sounds like a win-win situation. I originally purchased 10 yards of white pom pom trim from Amazon for the little one’s bedroom curtains but after adding the tissue paper tassels, I thought the trim might be a tad overkill. I also scored a killer deal on black gros-grain ribbon when I made my first set of curtains and had plenty (still do) left over so it worked out perfectly. With the hemmed curtains now ready, I needed to make sure I was embellishing the correct edges, so I identified the inner edge of each panel with a safety pin. Last thing I needed was to embellish 3 inner edges and 1 outer. That wouldn’t have been fun. I wasn’t quite sure how I was going to attach the pom pom trim at first but ended up hot gluing it to the backside of each inner edge. Worked like a charm. If you’re handy with a sewing machine, I’m sure sewing it on would be just as easy but sewing is my Mom’s thing so I opted for the quick and easy route. So far, I’ve had no issues with the hot glue holding up. Next, I cut a length of ribbon and hem tape to match. 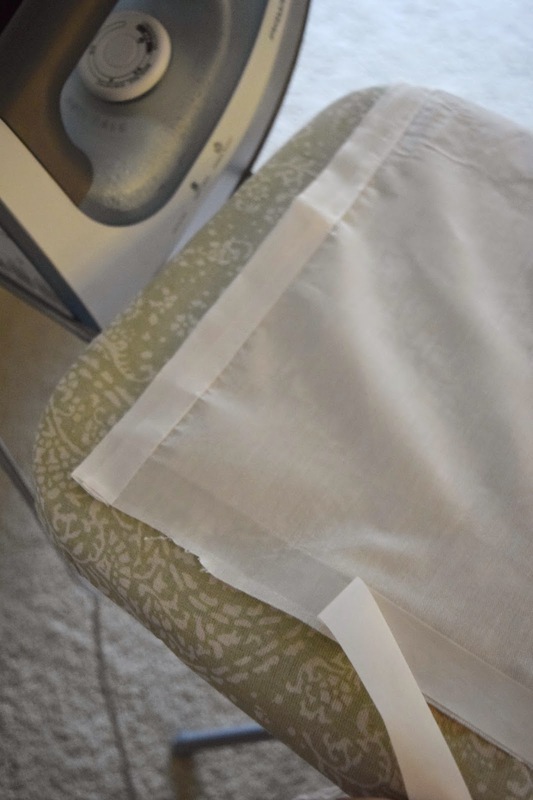 The length of your ribbon should match the finished length of your hemmed curtain panel but I always add a little extra in case of error and because I wanted to wrap the ribbon around to the backside of the panel for a cleaner look. 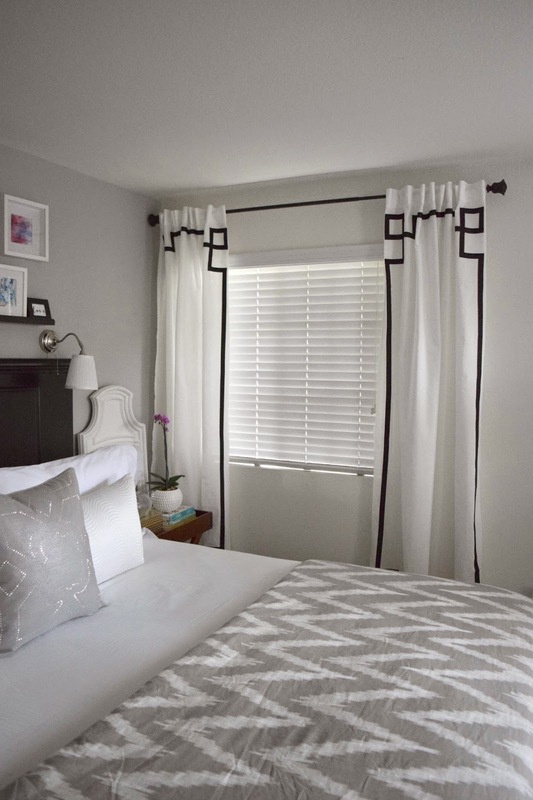 My finished curtain panels were 91″ so I cut my ribbon and hem tape at 95″. I adhered the hem tape to the ribbon the same way I adhered the tape to the raw edge of my panel. Now…with your panel right side up, lay the ribbon, shiny side down, directly along the inner edge of your panel making sure to position your ribbon so that you have a tail at the top and bottom and run your iron along the entire length of the ribbon securing it to the edge. Allow to cool and for the glue to take hold before you flip your panel over and iron down the tails at the top and bottom. Repeat for all your remaining panels. Next step? Hang up your curtains, stand back and admire your handiwork! Maybe do a little happy dance too…I sure did! What do you think? Easy enough? I think so! I finished all 4 panels in about an hour and a half! Way faster than the 6 hours I spent on the first ones. Can’t beat that! I think these work so much better for this space while still giving the windows some needed pop. Now with these curtains finished I’m turning my focus to the 3rd, yes 3rd window in this room. We actually have a door/window that leads out onto out patio to the right of the of the dresser here which also needs some sort of window covering. 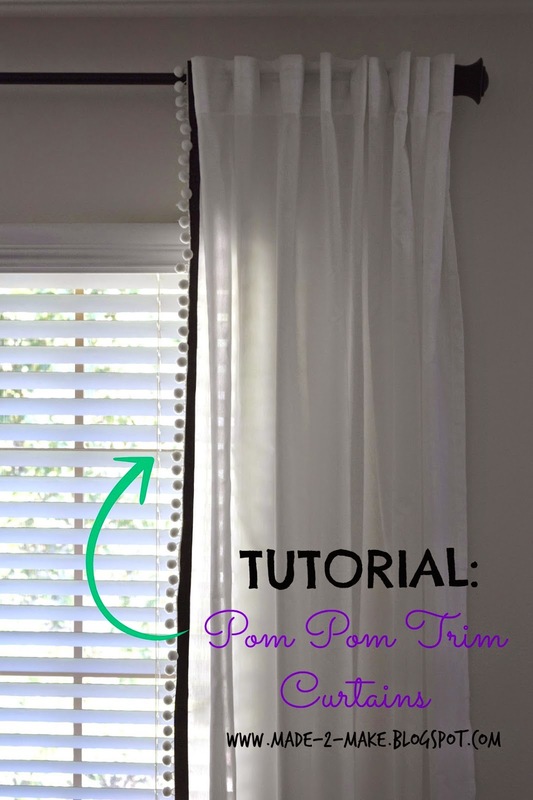 I’m thinking a roman shade would work out great so hopefully I can brainstorm a design that will not only work, but match the new pom pom curtains! Wish me luck! The curtains look great! I made a pair last month, and they've still got that 'new' look! I like how you use the tape to make it easier to get the extra stuff on the edges. I really enjoyed making mine, so I see how it can be fun to make more than one set.